In Square Enix's new Final Fantasy spin-off, evil can only be defeated by players with a strong enough voice. Square Enix has released its fair share of iPhone titles over the past couple of years, and its latest is Voice Fantasy. Just made available today, Voice Fantasy pits its players' voices against the forces of the evil Demon King. Instead of being able to choose your hero as in previous Final Fantasy titles, Voice Fantasy creates one for you based on your own voice. Voice Fantasy asks players to shout their hero's name into the phone, with the pitch and volume determining what kind of hero is summoned. Each hero has a different job, so a loud and low voice might summon a warrior, while a high voice could summon an archer. Square Enix also says that the heroes' personalities are affected by the voice that creates them. I can yell really loud, so I know my Voice Fantasy warrior would be extra strong, but a complete and total jerk. Voice Fantasy is purely about battling and features both single-player and multiplayer modes. The single-player mode puts you up against the varied forces of the Demon King, while multiplayer battles can be either one-on-one or two-on-two. Two voices may enter, but only one will leave. What I like about Square Enix's offerings on the iPhone is that many of them are developed specifically for the platform and take advantage of its strengths. First-person shooters might be possible on cellphones, but they're just not meant for them. 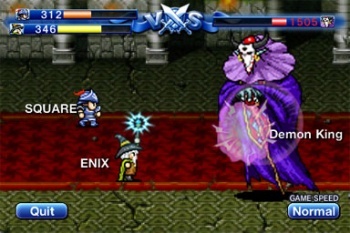 With Voice Fantasy, Square Enix used the abilities of the iPhone to create a simple $3 product you wouldn't really see anywhere else, aside from perhaps DSiWare, and tied it into its key franchise. The game is at least a bit of creativity on a platform that sees a lot of clones and lame games.